Another genius wreck...congratulations...but they would be nothing without your rockin commentary! HA! I was chuckling all through the commentary and let out a bark of laughter at the cake itself! That's great. Neither-happy-nor-merry Winter to you too! Oh god...suddenly last year's office party is replaying in my head. We had almost that exact conversation but without the sheisty Brooklyn accents. We also wound up with purple on our cake until my friend looked at it and said, "Purple eh? Trying to force Advent colors on us, eh?" Hey Jen, don't cookie "cakes" fall in the same category as CCCs? Ewww brown frosting. I can just imagine that oozing between people's teeth and not looking anything like icing. I suppose on the bright side, it wasn't yellow snow. hmmm, did i catch the hint that someone has seen 'Oscar'? If not, you should watch it! Great cake, it's almost as good as "I want sprinkles"
Considering that my daughter had an accident yesterday which resulted in $6100 damage to both cars, Winter offends me. This is so over the top PC I snorted Christmas Tea ... jeesh, ridiculous. Ooh, "Oscar" references! Yeah, whoever decorated this cake is an ox and a moron. W...T....? My head hurts trying to figure out this little beauty. But is the blank space intended for the customer's personalized message (to be added by a semi-incompetent counter clerk whose skills at spelling, spacing, and penmanship may be up for debate)? If so, what does one write that would not be a non-sequitur with "Winter"? I'm confused...is the cake even frosted w/ the preliminary base coat, I mean is it a naked cake w/ a snowman on it and some purple trim, or did they frost it w/ poo colored frosting first? Is it a brownie? or frosted with Brown icing? Why o why do they have to use that brown poo color as the background always?!! It's nasty. Who buys that? You would think they could at least put a giant snow flake in the middle unless that was meant to be blank for someone to add a message. "Winter, Sorry you have SAD but here's a brown poo cake with a happy snowman!" uh i don't get it. what's this have to do with gangsters? reaching, much? WOW...what a boring cake...the snow man is cute...very nonoffensive... If they didn't tell us that it was winter I would never have known. Proof that politically correct is....incorrect. Hey, I am from San Diego, and I find it offensive that winter always has to be associated with snowmen. I think that all snow-related references should be banned! Um....Wow. Is that unfrosted, frosted with poo, or just plain moldy? And why is that poor snowman all alone over there in the corner? It looks like the word WINTER is about to crush his little head. @Angela - it's a movie reference. Perhaps the base color choice was to make people in warmer climates feel included. "And no white frosting, ya numbskull, all dem folks down South might be accusing us of only showing a Yankee winter." Or maybe this is the end of winter when everything has turned to mud but the snow man still clings to life. If that were true though, he's looking too good. His head would have to be peanut sized and his hat would be on the ground. I'm sorry, but you are the best writer, EVER!! "Poiple." LMAO! I can't believe this is a real cake. Its the saddest attempt at celebrating a season ever. 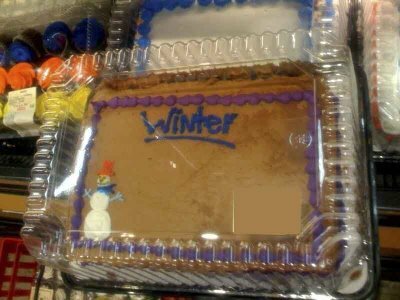 And who buys a winter cake? I just don't get the brown icing....and wouldn't white frosting be much more "wintery"? It's 80% YOU, you know. You're a freaking genius. From the comments posted, yes, that must be the case. An overtly politically correct cake decorator with the hidden agenda of ruining Christmas. My guess is the decorator had some extra purple frosting in the bag, a blank sheet cake, and a lack of imagination. The story concocted was JUST A STORY (albeit brilliant and hysterical... Jen, I must give kudos for your spelling to make it read as perfect gangsterese!). That commentary was pure brilliance! I especially liked the fact that you spelled the accent...a la "poiple" hahahahah! wv: sprong- the new grammar. "Spring has sprong." An underline killed my family! The commentary really set the tone for this one! Love it! That's awesome, I mean really. Wow. If they were going for realism wouldn't you do that with white frosting mixed with crumbled oreos? Hey, now, you can't be celebrating Winter. That's just pagan!!! I totally thought this was a cookie cake at first, but on closer inspection it is so much more insidious. Why, why, why should a 'winter' cake simulate tanned leather? Your commentary had me in stitches this morning! Word verification: fobbe: a new style in leather jackets, and the inspiration for this cake's frosting. ah, jen, those were some SWEET "oscar" references!!! one of my all-time favorite movies:) i could just picture them all doing this 'scene' too. i love that you love all the movies that i love!!!! hahahaha have a happy WINTER everyone! Ahh, the cake was very good but the conversation with Bugsy and Boss made it. Poiple is the word of the day! OMG! LMAO!! Love the brown barren earth. I guess all the snow went into the nongender snowperson. Not that persons are superior to any other species, extant or extinct. Oh man, I snotted when I finally got to the wreck!!! Word verification: Plarsl. That is the noise I made when I snotted! The point of this gigantic "white space" on the cake was so the decorator could inscribe the full lyrics of the Christmas classic "Let snow, let it snow, let it snow." Either that or a fanny imprint, I'm not sure. I think the snowman is actually kind of cute, if only it weren't so oddly placed. And I love the underline, but I also think it needs a period. "Winter. ", as in there's nothing more to say about this horrible, depressing time of year. Love your commentary, though. That's the best part. It takes a certain level of brilliance to work "poiple" into a cake commentary. Kudos! I've never commented before, but had to on this one. The "cake" in itself is so-so, but the genius dialogue makes it golden. Love it!